This week the Ethiopian premier Dr. Abiy Ahmed successfully participated in the World EconomicForum (WEF) which was held in Davos, Switzerland, with a view to highlighting the ongoing reform thriving in the length and breadth of the country since he came to power. He touched upon salient issues revolving around the nuts and bolts of Ethiopia winning the hearts and minds of participants in the blink of an eye. Since the Ethiopian premier took the reign of power he has been making astounding reforms in every sector of the administrative machinery and unchaining Ethiopians from the yoke of oppression. He has been ensuring justice and democracy nationwide turning a deaf ear to narrow-minded attitudes. Thus the premier’s fame has spread far and wide in a short period of time. Pertaining to the aforementioned issues, this journalist approached some experts on the issue. According to Economist Tekelebrihan, getting a chance to partake in Davos is not a ‘low-hanging fruit’. I would say, our Prime Minister Dr. Abiy Ahmed stood chance to partake in Davos considering his successful socioeconomic and political reforms, which made the Premier the talk of the world in a little while. What many leaders failed to do for decades, he did with finger counted months. While many leaders swam against the popular tide, he managed to ride aligning himself with the tide. Speaking at the World Economic Forum was a big honor and opportunity for the Premier and the country he represents. 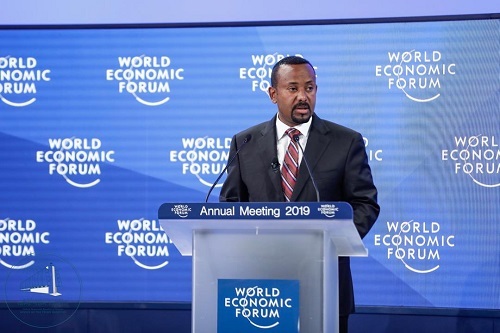 Addressing audiences at the Davos World Economic Forum the premier said, “Ethiopia today is among the fastest growing economies in the world, consistently averaging economic growth of over nine percent. Poverty has been halved and education enrollment has markedly increased. The significant investment in infrastructure is contributing to the rapid growth. It is attracting foreign direct investment, making Ethiopia one of the leading FDI destinations in Africa. The resident of Addis Ababa Mesert Tefera, lawyer by profession, regarding Medemer (synergy) said, “The philosophy of Medemer has rescued the country from getting into uncharted waters. Our Premier has come with a panacea—Accretion— which takes the country to the helm of success almost immediately. He has really made an amazing transformation in a few months. Ethiopia is now in good hands. Though unrest crops up in some parts of the country by unreformed segments of the society, the bottlenecks are being arrested. According to her the violations of human and democratic rights in Ethiopia are currently no more thanks to the Premier, who came to the global limelight and votaries of peace, democracy and development. 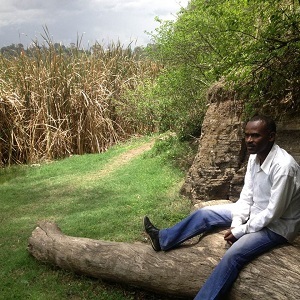 In today’s Ethiopia there is no harboring fear while expressing one’s view. Journalists do not throng prison cells. If things go in the new pace, in the not distant future Ethiopia will reclaim its ancient glory. According to the Office of the Prime Minster, Ethiopian Premier Dr. Abiy Ahmed had held talks with Professor Klaus Schwab, originator as well as Executive Chairman of World Economic Forum and tossed ideas around the significance of a joint approach on business, government and the private sector, civil societies and what not with the purpose of dealing with main global tackles. What is more, the premier also met with interim president of the World Bank Kristalina Georgieva. By the same token, the Ethiopians premier held talks with George Soros, Head of the Open Society Foundations and discussed issues revolving around regulatory reforms, electoral integrity, challenges of democratization, access to justice, economic inclusion and other related aspects. Next post Italy and France: Used to be friends… or is it suddenly not so?